Do a quick search for the best legit faucets or top free bitcoin faucets and you’ll get thousands of results. Navigating through this ocean of choice can be tricky as there are hundreds of dud sites out there, many of which are outright scams. But never fear, we’ll steer you in the right direction and ensure that you begin your cryptocurrency adventure with some of the best, high-paying and reliable free bitcoin faucets around today. It’s not hard to come up with a ‘top’ list – just surf around this website and you’ll see that there’s a handful of sites that are clearly our favourites. This is based on personal experience over many months, so we’re extremely confident in our recommendations. You’ll notice that many of our recommendations begin with the word ‘Moon’. That’s because they all belong to the same group and offer the same easy-to-use functionality plus similar bonus systems. The latter is worth singling out for special mention as it means you can earn more bitcoins (or rather fractions of bitcoin, known as satoshi) in a shorter space of time. To give you an example: Say the basic claim amount on Moon Bitcoin is 50 satoshi, you can quickly turn that into 300 satoshi with a (up to) 100% daily loyalty bonus, a 100% referral bonus, a 100% offer bonus, a 100% mystery bonus and a 100% mining bonus. The loyalty bonus is dependant on your claiming from the site for 100 days straight. To earn the maximum referral bonus you need at least 100 people to sign up using your referral link and claim daily (more about referrals here and here). It’s worth noting here that the referral scheme for Moon Bitcoin is one of the highest-paying around – you earn 50% of the value of whatever claim is made by a referral. All the other faucets mentioned above offer referrals payments of varying amounts. To achieve the offer bonus, you need to participate in a few of the deals available under the ‘offers’ section of the site. These range from filling out surveys to carrying out flight searches, but in all cases you earn bitcoin for completing the tasks as well as increasing your bonus. The mystery bonus is self-explanatory, while the mining bonus is paid in return for you agreeing to allow your PC to mine coins while you surf. The longer you mine for, the more bonus you’ll accumulate. It’s also one of the few ‘on-demand’ faucets out there, ie subject to a minimum 5-minute wait you can claim whenever you want, with the claim amount rising quickly to start with then gradually slowing down. All the faucets we’ve listed apart from Free Bitcoin are connected to the CoinPot microwallet service. This is a free, browser-based system which enables you to gather your coins together from all the faucets into one place. This offers the advantage of enabling you to build up a more significant pot of coins much sooner. CoinPot also allows you to convert between currencies instantaneously – handy if you’re committed to collecting one specific coin. Free Bitcoin is a stand-alone faucet that pays directly to your bitcoin wallet. It differs from many other faucets in that it also offers a weekly lottery that you’re automatically entered into when you make a claim (you can buy extra tickets as well), a hi-lo gambling game and interest on any deposits held there. In addition to this, every hour one person who claims from the faucet wins $200 in bitcoins, plus there are a range of smaller prizes as well. And each time you claim you earn reward points which can be redeemed against a range of electrical items when you collect enough. Free Bitcoin is one of the oldest faucets on the web and is highly trusted. As with the other faucets, it offers a generous referral scheme which, in addition to paying a percentage of each referral claim, also adds lottery entries and reward points to your balance. In case you’re new to faucets, you can read our complete guide to getting started which talks you through the process. Head over to Coinbase (or another wallet provider) and get a free bitcoin wallet. If you use our referral link to sign up you’ll get $10 of free bitcoins if you buy or sell more than $100 of cryptocurrency. We get the same so it helps support this site. 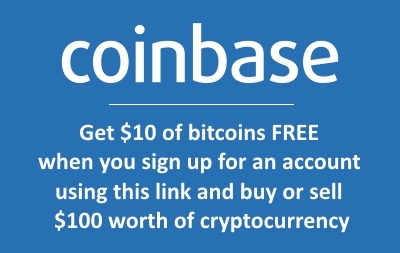 Sign up to the faucets above using your bitcoin wallet address from Coinbase. Sign up to CoinPot and link your bitcoin wallet address to your account. Boom and you’re done. You can now start earning. We use all of the faucets mentioned on a daily basis and withdraw coins from Coinpot to Coinbase frequently so we can vouch for the reliability of these services, something which can’t be said for a lot of the faucets out there. It’s not uncommon for faucet owners to start out with the best intentions before realising the financials don’t add up. Sometimes, whether accidentally or deliberately, they leave the faucets running (and thus earning from the adverts) but they don’t pay their visitors. If you’re new to bitcoin faucets then the ones mentioned here are a great starting point to your cryptocurrency adventure. And remember, if you have any questions or need help getting started, please get in touch. We’re always happy to help.